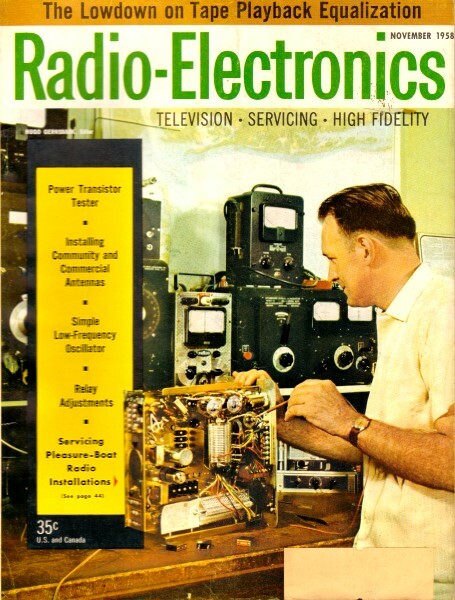 Here is a very useful article on the benefits and technical challenges of stacking antennas. 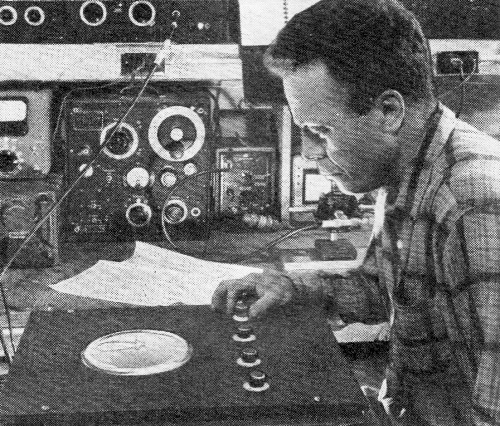 It avoids rigorous mathematical analysis and instead presents recommended guidelines and includes some very nice measured antenna patterns (no computer-generated predictions in 1958) of the various configurations. The authors discuss radiation pattern changes based on horizontal versus vertical stacking, and a combination of both. This is the first of a series written by engineers at the Scala Radio Company. By Engineering Staff, Scala Radio Co. There are many good books on antenna theory. 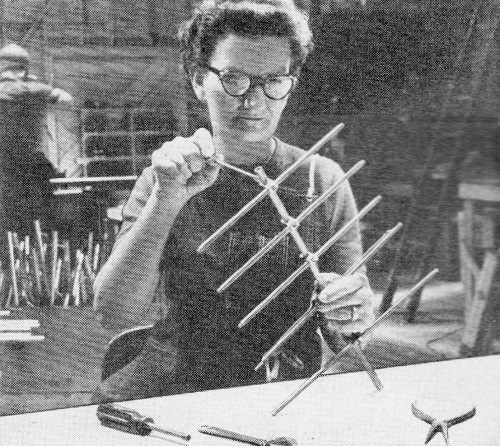 However, very few data are available on antenna installation techniques. Technical problems met in practical work have been almost completely avoided. Fig. 1 - Scale-model Yagi antenna is constructed with careful attention to detail. Fig. 2 - Yagi antennas are tested with installation which approaches ideal. Fig. 3 - Radiation patterns are checked on accurate laboratory equipment. 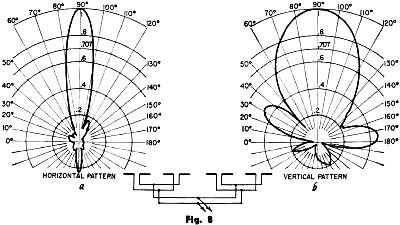 Electronic patterns are traced on scope screen. Generally, we stack antennas to increase gain. In practice a gain of approximately 3 db is possible each time the number of antennas is doubled. Two dipoles stacked vertically or horizontally have an approximate gain of 3 db over a simple half-wave dipole. A 4-bay antenna has a gain of approximately 6 db, an 8-bay job yields a gain of approximately 9 db and a 12-db approximate gain is possible from a 16-bay array. In stacking antennas we also automatically increase the directivity in the plane in which the antennas are stacked. A dipole is bi-directional. The two major lobes are at right angles to the elements. No energy is radiated from the ends of the dipole. Dipoles can be stacked vertically, and this confines the energy on the vertical plane. It gives a sharper radiating pattern on the vertical plane, without affecting the horizontal plane. Stacking dipoles horizontally confines the horizontal radiating pattern, without affecting the vertical pattern. When dipoles are stacked both vertically and horizontally, energy is confined to both planes. A gain of about 5 db is obtained by merely adding a director to a dipole. A little more gain is obtained by using a reflector instead. The forward radiating pattern of a dipole with reflector is reasonably similar to that of a dipole with a director. However, the effect on the rear lobe is more pronounced, and a higher front-to-back ratio is obtained with a reflector. Properly terminated antennas do not cause radiation from the transmission line or noise pickup. This applies to a perfect termination, however, which may be difficult to obtain in practice. These considerations will be discussed in detail later. 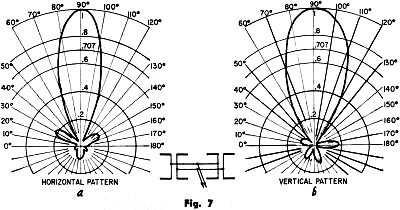 Assuming a solid wavefront, when a given number of Yagi antennas are stacked, the same gain should be obtained whether stacking is vertical or horizontal. If the expected gain is not obtained the installation has been made incorrectly. Note that the method of stacking changes the directional characteristics greatly. Incorrect stacking can cause complete failure. Hence, a study of both the horizontal and vertical radiating pattern was made on exact 10-to-1 scale models of 10-element Yagis. This means making all dimensions of the antenna 1/10 in size and energizing the structure at 10 times the frequency of the reference antenna. Fig. 1 shows such a test antenna. 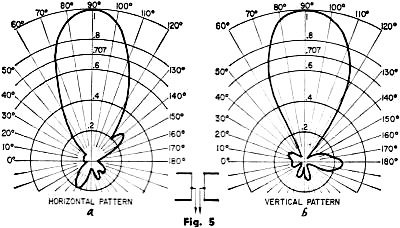 The radiation patterns of a single Yagi are seen in Fig. 4. Note that the horizontal pattern in Fig. 4-a is symmetrical, except for a small lobe on the right. This disturbance is intentional and shows the effect of an unwanted signal. At a later point, it is shown how this disturbance can be reduced greatly by proper stacking. If two Yagis are stacked vertically, the pattern changes little horizontally. The half-power point (0.707 voltage point) is still at 40 0. However, the ver­tical pattern is considerably changed. The half-power point is no longer at 60°; the pattern is now much sharper, and the two side lobes in Fig 4-b are greatly reduced (see Fig. 5). Now, consider two Yagis stacked horizontally. You will note from Fig. 6-b that the vertical pattern is unaffected. It remains the same as for a single antenna. 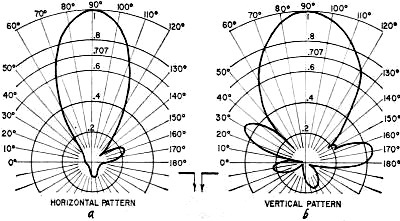 The horizontal radiating pattern (Fig. 6-a) is considerably changed. The half-power point is now 20°, not 40° as in Figs. 5-a and 4-a. 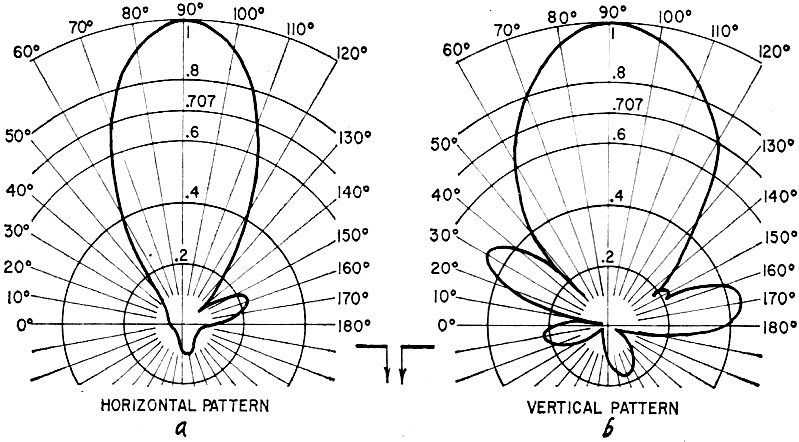 These tests show that the radiating patterns of antennas are changed only in the plane of stacking. Thus, if two antennas are stacked horizontally, the horizontal pattern is changed - the vertical pattern is not. 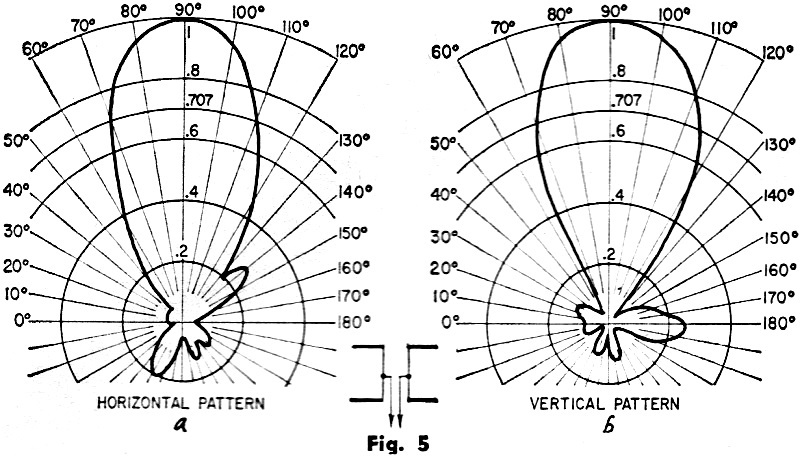 Likewise, if two antennas are stacked vertically, the vertical pattern is changed - the horizontal pattern is not. Fig. 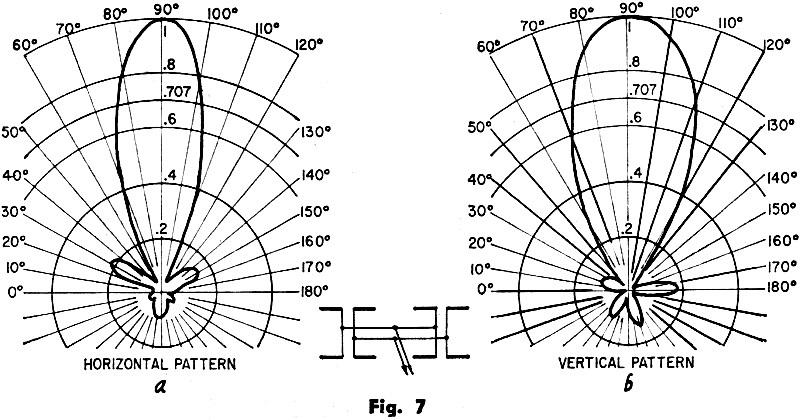 4 - Polar patterns of single 10-element Yagi antenna: a - horizontal; b - vertical. Fig. 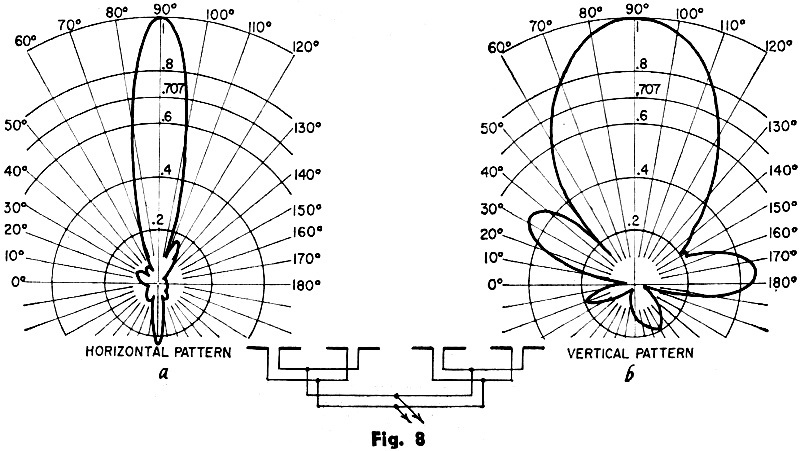 4-b depicts the vertical radiation pattern of the same antenna. 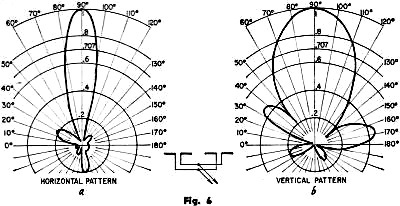 The smaller lobes on either side of the major lobes are typical of a single Yagi. They result from side radiation of the driven element. We will show how these lobes are also eliminated by proper stacking. Fig. 5 - Pattern of 2-bay vertically stacked Yagis: a - horizontal plane: b - vertical plane. Installations often require polar control of both horizontal and vertical patterns. Hence, we give next the result of stacking four antennas. Two were stacked vertically and two horizontally. The two banks were phased together and the patterns observed in vertical and horizontal planes. Fig. 7-b shows how the half-power point in the vertical plane becomes 38° in this configuration. The half-power point in the horizontal plane becomes 25°. It is interesting to note the similarity between the Fig. 7-b quad stack and the Fig. 5-b two-bay vertical stack. The same similarity is seen between the Fig. 7-a quad stack and the Fig. 6-a two bay horizontal stack. 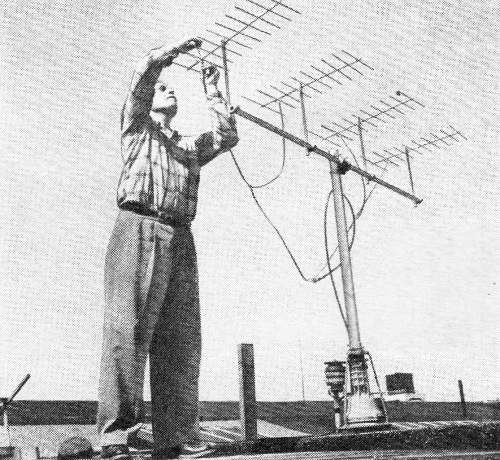 The possibilities which can be realized by the field technician are further illustrated by stacking four antennas in the horizontal plane. Fig. 8-a shows the horizontal polar diagram of this configuration. 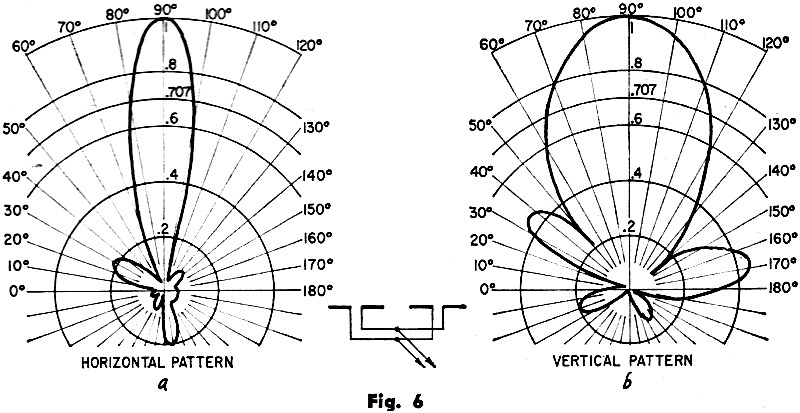 Note the narrow beam width of 15°. Note also that the side lobe of Fig. 4-a has almost vanished. The vertical pattern (Fig. 8-b) is practically unaffected and remains the same as in Fig. 4-b. As might be anticipated, similar tests results can be expanded to any number of antennas. However, the practical worker is seldom concerned with more than four. If you observe the polar patterns which have been illustrated, you will be able to solve many practical problems easily. For example, if you have co-channel interference from the side, you can eliminate it by stacking antennas horizontally. Noise which arrives from below the installation can be reduced or eliminated by stacking the antennas in a vertical plane. If interference arrives from both sides and below or above the antenna site, stack antennas horizontally and vertically. Following installments will explain how to control co-channel interference, reflections, space loss and similar practical field problems. Fig. 6 - Two-bay horizontal stack: a - horizontal pattern; b - vertical pattern. Fig. 7 - Four-bay array stacked horizontally and vertically: a - horizontal pattern; b - vertical pattern. Fig. 8 - Horizontally stacked, 4-bay array: a - horizontal pattern: b - vertical pattern.